Explore two seemingly different areas, art and science. Research the history of science and photography and the impact the two have had on one another, and then create your own artwork using science. Essential Question: Can we use science to make art? Research and Analysis – explore link between art and science. Information management – evaluate, gather, sort, and store information. Artistic process – conceive, develop, and create artistic work using the cyanotype method to produce images. 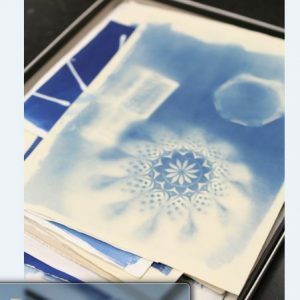 Scientific process – use information from the chemistry teacher and online sources to experiment, measure, and create the chemical process necessary for making cyanotypes. Follow instructions – found online to mix chemicals. Writing – document finds and create informational slides for presentations. Reasoning and application of learning – through the creation of the cyanotypes and the research paper. 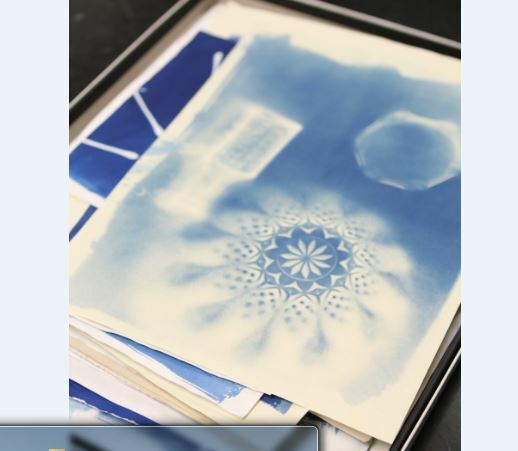 Research cyanotypes, how to create them, and the role they played in the history of photography. Research 10 photographic contributions to science. Collect and manage the photographic contributions, analyzing which contributions are most important and relevant and which should be included in presentation. Use Google Slides, Powerpoint, or Prezi to create a presentation teaching the audience about cyanotypes and the role of photography in science throughout history. Collect the necessary chemicals to make one (student may partner with the Chemistry teacher to determine to use the lab and have assistance mixing chemicals safely). Create cyanotypes on paper or t-shirts. Photograph all cyanotypes and include them in final presentation. Answer analysis and conclusion questions. Write reflection on specific competencies and how they achieved them. Student will create a final presentation using Powerpoint, Prezi, or Google Slide Show. They will also answer the analysis and conclusion questions in the additional materials handout, after completing the cyanotype process. They will present this during a one-time after school showcase. The presentation will include the 10 photographic contributions to science, images of the cyanotype prints the student made, and a reflection. This ELO can be modified to fit any student’s interests. The most important aspects of this ELO are the creation of the art pieces using the science based chemistry and the research that links science and art. In this case, I used photography as the art form, but there are many other art forms that link to science. At ConVal the chemistry teacher generously gave up two of her prep-periods to work with the student to mix the chemicals. Once the chemicals were made the student was able to complete the process and make the artwork on his own. Some students may be able to complete this ELO independently while others may need more direct assistance or guidance.